Home / Latest News / Oshkosh Airventure a Total Success! Team BlackHawk traveled thousands of miles to Oshkosh Wisconsin for the 2013 Airventure aviation supershow. 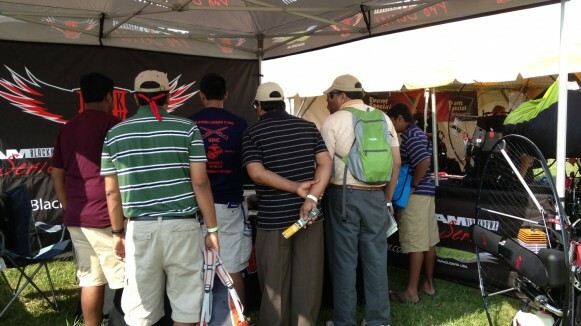 Thousands of the half-million attendees stopped by the BlackHawk Paramotor booth throughout the event. Most people had never seen a Powered Paraglider before and were thrilled at the thought of owning their own personal flying machine for under $7,000. “This was an amazing opportunity to promote our sport to people who are fans of aviation. My voice was gone by the end of each day from talking to people. Our team had a blast out there” – said Mike Robinson of BlackHawk. All of the latest machines from BlackHawk and wings from Velocity Paragliders were showcased. Airventure provided a perfect launch field where countless spectators watched Team BlackHawk pilots demonstrate what Powered Paragliding is all about. As soon as pilots landed, they were bombarded with questions like “how do I get one of those!” BlackHawk’s debut at the event was a total success and we look forward to another Airventure adventure next year! Next BlackHawk heads to the jungles of Costa Rica!